The United States and Mexican War ended less than two years after it began, with the American forces victoriously occupying Mexico City. On February 2, 1848, the Treaty of Guadalupe Hidalgo was signed by representatives of both countries. The treaty ceded New Mexico (which included Arizona), California, and Texas to the United States, described the new international boundary, and set forth the terms of peace. It called for Border Commissioners and Surveyors to be appointed by both nations to survey and mark the new boundary which, in some areas was rather ambiguously described in the treaty. 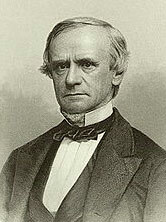 John Russell Bartlett was appointed United States Boundary Commissioner in 1850. His experiences are recorded in the two-volume set Personal Narrative of Explorations and Incidents in Texas, New Mexico, California, Sonora, and Chihuahua 1850-1853. Bartlett, a Rhode Island book dealer, seemed more interested in writing a travelogue than completing his appointed task. He spent much of his two-year stint visiting places unrelated to the survey. A major dispute arose during Bartlett’s tenure over the location of the line. Bartlett agreed early on with the Mexican Commissioner, Pedro García Conde, to run the southern boundary of New Mexico west from the Rio Grande above Las Cruces rather than above El Paso as the treaty intended. This resulted in the loss of hundreds of square miles of land that the United States needed for transportation corridors. Bartlett was criticized by Washington bureaucrats and his own surveyors for this blunder but was off on his adventures during much of the furor. In Arizona, the original international boundary was the Gila River. One of the many reference markers placed by the surveyors was atop a small knoll at the confluence of the Gila and Salinas (Salt) Rivers, west of the modern city of Phoenix (now on the grounds of the Phoenix International Raceway). 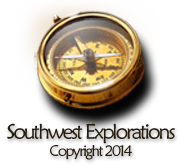 This spot was later agreed upon as the initial point for all land surveys in the state of Arizona. In the summer of 1851, Bartlett spent a few weeks camped at Maricopa Wells, about 7 miles north of the present town of Maricopa, Arizona. His experiences there provide fascinating reading to anyone interested in the history of the area around Phoenix. In 1854 the United States acquired almost 30 million more acres from Mexico in the Gadsden Purchase. This moved the international boundary in southern Arizona and New Mexico to its current location. Major W.H. Emory completed a survey of the new boundary in 1855.